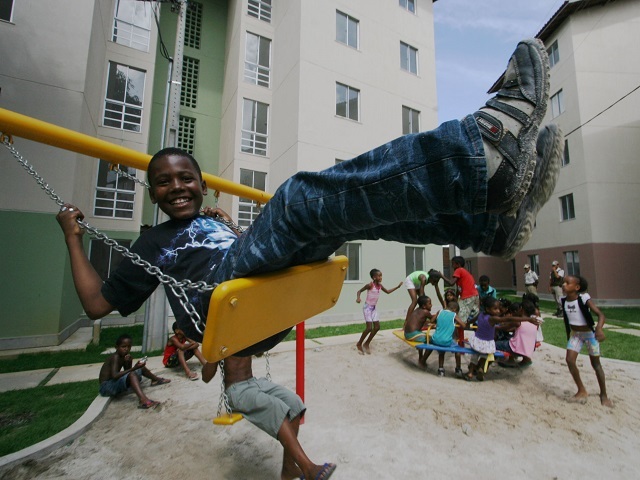 Brazil’s Minha Casa, Minha Vida (MCMV – “My House, My Life” in English) program was created to provide housing and improve quality of life for low-income families across the country. Currently, more than 9.6 million low- and low-middle income families reside in the program’s condominiums, spanning rural and urban areas. Started in 2009 by Brazil’s federal government, MCMV has constructed approximately 2.2 million housing units in five years, and ranks as the largest affordable housing project in the history of the country. MCMV began partly as a response to the rapid urbanization Brazil has seen over the last few decades, which has outpaced investment in urban infrastructure and basic services. Indeed, roughly 85 percent of Brazil’s population currently lives in cities, with the highest rate of urban growth taking place in the 1950s and 60s. As Brazilians migrated to the cities, many struggled to find housing within their financial means and were forced into favelas or informal settlements to get by. MCMV’s goal is to help these low-income families find stable, affordable housing while promoting a sense of community. Nationwide, approximately 224,000 families have benefited from the program’s solar water heating system for their showers. According to the Brazilian Association of Air Conditioning, Refrigeration, Ventilation and Heating, the systems can reduce home electricity bills by up to 30 percent. The installation of the systems will later be accompanied with information on how to reuse and conserve water at home.